It’s time for Brag Monday #48! Once again I’m bragging about two more projects from the last Brag Monday party. 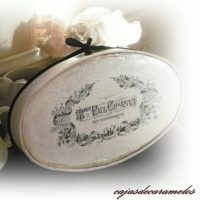 First I’m bragging about these lovely French Cans made by The Little Things! 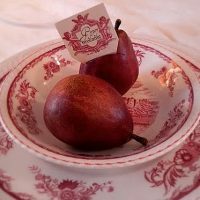 She used some of the French Postcard images from HERE Be sure and check out her site, as she’s included some great tips and tools that you can use to make this project! Next I’m bragging about this adorable Goth Moth Shoe , created by Jan at Jan’s Eclectic Mix Blog. Jan colored in the black and white Moth image found HERE. 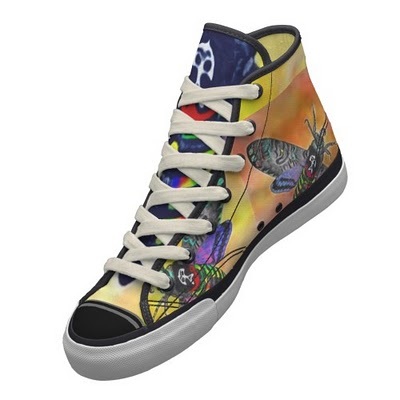 And then uploaded the image to create these sneakers in her Zazzle shop. How cool is that?! 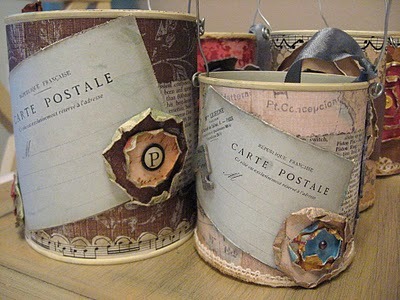 I am always looking for new ideas for old cans – this is great! Those postcard images are great Karen – so much you can do with it!!! Wow! Those sneakers are AWESOME! I just loved the picture of the ship I used. I have loved all the graphics you find and this is the first time I actually used one in a project. I think it came out pretty well. Thanks so much! and the cans are great too. Just love your Brag Monday! Wow–those are amazing “brag” items–fantastic! Those are truly inspired…thank you so much for sharing them with us–they are awesome. Karen, this is the first time I’ve linked to your party, but really wanted to thank you for all the images you share daily. My project seems quite simple compared to the beautiful pieces of art linked on your blog. I will visit each one of them for! Thank you for hosting! Dear Karen, thank you so much for featuring my Goth Moth sneakers! 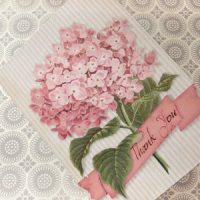 I am truly honored, and what a great boost for my blog and shop – the hits are pouring in 🙂 I really appreciate all the work you do for this great blog. Karen – thanks so much for your nice comments on my theater box! I love “absorbing” all the great creative energy here, especially “Brag Monday”! (LOVE those shoes) Thank you for the powerful, positive, creative force you share with all of us. I’m so glad you all are enjoying these projects as much as I do!! Jan, that’s too funny about the word verification! Sounds like sign too me, perhaps you’re meant to do a whole shoe collection! Thank you so much for featuring my altered cans ! How wonderful is that ! I love brag Monday !Just want to thank you so much for all of the fabulous images you share for everyone to enjoy, your blog is amazing ! So creative projects … just love all the images, thanks a lot.